High Polished, 14K Rose Gold Wedding Band Ring. Copper is mixed with pure gold to create a pinkish hue, commonly referred to as "rose gold". All of our rose gold wedding bands are guaranteed 14k solid gold. Many companies use light-weight bands to reduce their costs. 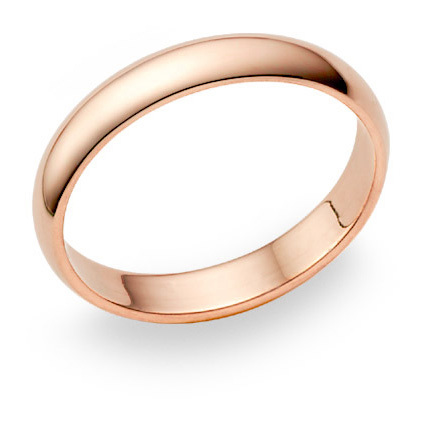 All of our rose gold bands are solid, substantial pieces, guaranteed. We guarantee our 14K Rose Gold Wedding Band Ring (4mm) to be high quality, authentic jewelry, as described above.